Could you do the Knight's Tour in 3 minutes in front an audience of millions? That is exactly what Paul Broad from Cardiff, Wales did on Saturday 23rd October on the ITV show The Moment of Truth hosted by Cila Black. Paul had a week in which to memorise the Knight's tour across the board before testing out his memory in front of millions of views in the UK. Congratulations to Paul for completing the Tour successfully! In the Knight's Tour the Knight must travel to every square on the board without entering any square more than once while moving in it's L-shape as it normally would in a game of chess. There are many ways of achieving this. The example which follows shows one variation. 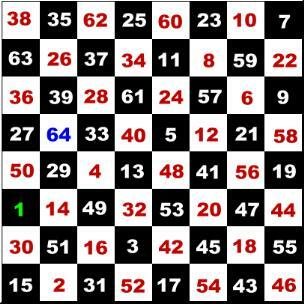 The Knight starts on the square numbered one and travels to each square in numerical order, finishing on square 64. On the board below click on the starting square and the knight will complete the tour across the chessboard. You will need Microsoft 4 or higher or Netscape 4 or higher to view this applet.